Konstantin Makovsky proved his talent in all genres, but portraits are still his most significant legacy. Makovsky s portrait gallery contains many hundreds of works, among them images of emperors and kings, not only from Russia but also from other nations, as well as images of aristocrats, officials, actors and scientists. It is known that during the artist s visit to the United States, Roosevelt posed for his first presidential portrait. 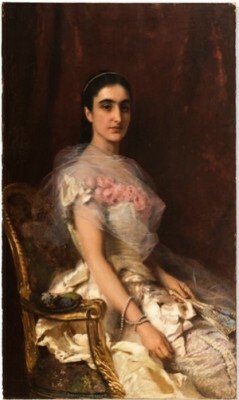 The end of the 1870s to the first half of the 1880s was the highest blossoming of Makovsky s activity as a portrait artist. The newspaper Stock Exchange News wrote, He earned hundreds of thousands a year. All high society hurried to get their place in the queue for Makovsky to paint their portraits. For his success, they called him the Russian Rubens and the Russian Van Dyck . Grand portraits of ladies have a special place in the work of Konstantin Makovsky, and he painted them with particular panache. An admirer of feminine beauty, the artist cleverly underlined it with extravagant accessories, profitably adding to the image with luxurious details of the interior, creating a portrait-image. 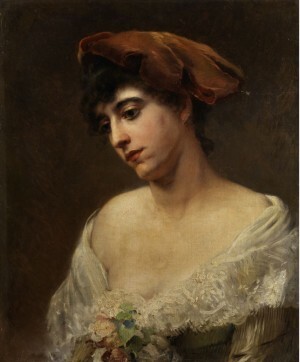 By frequently painting his wife, Yulia Pavlovna Makovsky (1859-1954), born Letkova, who was considered the greatest beauty in St. Petersburg, Makovsky developed an ideal type of feminine beauty and embellished many of his models with these characteristics. 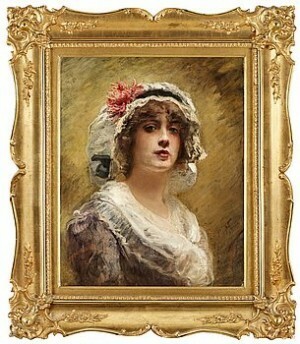 To be captured by the brush of Makovsky was the dream of many ladies of the time. 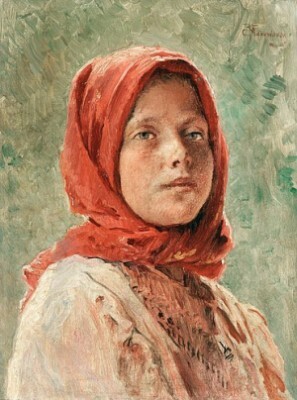 Konstantin Yegorovich Makovsky was an influential Russian painter, affiliated with the "Peredvizhniki (Wanderers)". 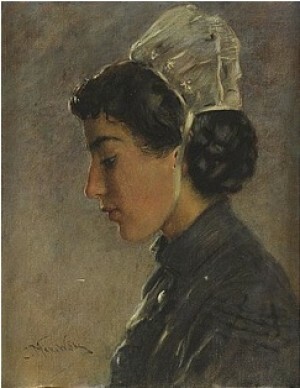 Many of his historical paintings, such as The Russian Bride's Attire (1889), showed an idealized view of Russian life of prior centuries. 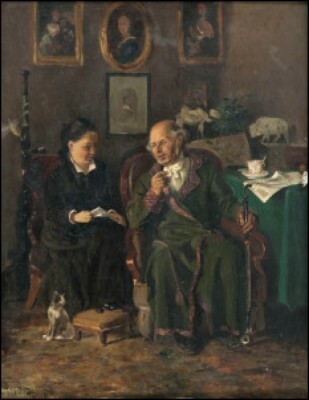 He is often considered a representative of a Salon art. 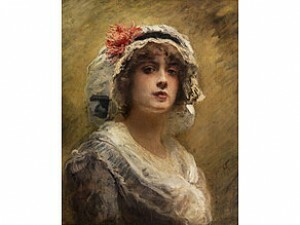 Konstantin was born in Moscow as the older son of a Russian art figure and amateur painter, Yegor Ivanovich Makovsky. Yegor Makovsky was the founder of the art school that later became the famous Moscow School of Painting, Sculpture and Architecture. Among the friends of the family were Karl Briullov and Vasily Tropinin. 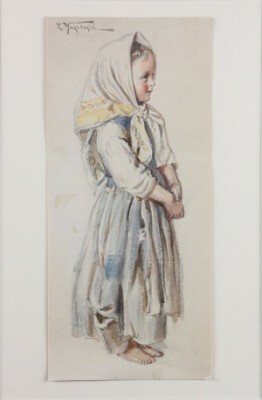 All children of Yegor became notable painters (see Makovsky). Later Konstantin wrote "For what I became I think I should thank not the Academy or Professors but only my father." In 1851 Konstantin entered the Moscow School of Painting, Sculpture and Architecture where he became the top student, easily getting all the available awards. His teachers were M.I. Skotty, A.N. Mokritsky, S.K. Zaryanko, all of them pupils of Karl Brullov. 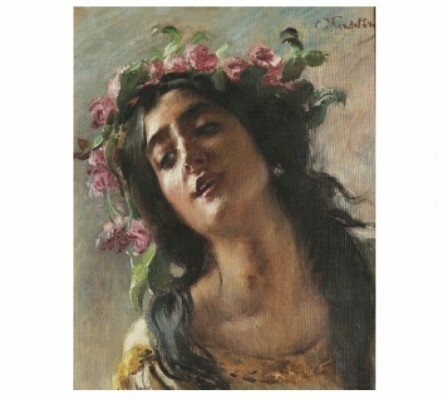 Makovsky's inclinations to Romanticism and decorative effects can be explained by the influence of Briullov. In 1858 Makovsky entered the Imperial Academy of Arts in Saint Petersburg. 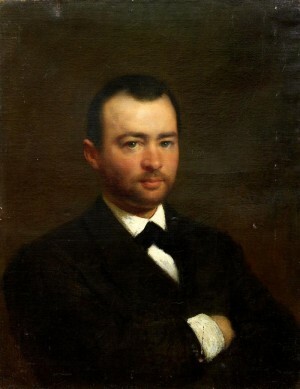 From 1860 he participated in the exhibitions of Academia with paintings such as Curing of the Blind (1860) and Agents of the False Dmitry Kill the Son of Boris Godunov (1862). In 1863 Makovsky, together with the other 13 students eligible to participate in the competition for the Large Gold Medal of Academia, refused to paint on the set topic in Scandinavian mythology and instead left Academia without a formal diploma. Makovsky became a member of a co-operative (artel) of artists led by Ivan Kramskoi, typically producing Wanderers paintings on everyday life (Widow 1865, Herring-seller 1867, etc.). From 1870 he was a founding member of the Society for Traveling Art Exhibitions and continued to work on paintings devoted to everyday life. 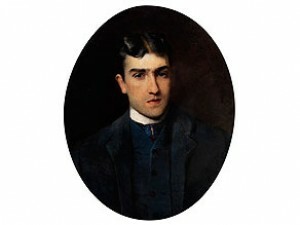 He exhibited his works on both the Academia exhibitions and the Traveling Art Exhibitions of the Wanderers. 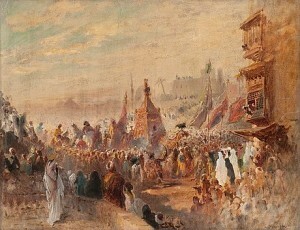 A significant change in his style occurred after traveling to Egypt and Serbia in the mid-1870s. His interests changed from social and psychological problems to the artistic problems of colors and shape. 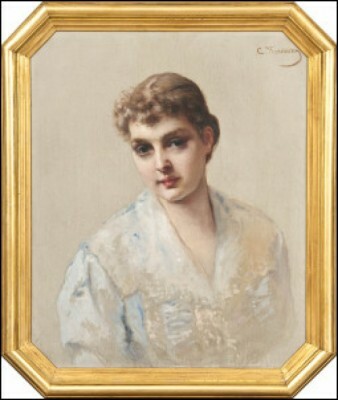 In the 1880s he became a fashioned author of portraits and historical paintings. At the World's Fair of 1889 in Paris he received the Large Gold Medal for his paintings Death of Ivan the Terrible, The Judgement of Paris, and Demon and Tamara. He was one of the most highly appreciated and highly paid Russian artists of the time. 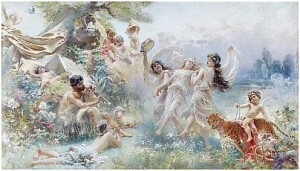 Many democratic critics considered him as a renegade of the Wanderers' ideals, producing (like Henryk Siemiradzki) striking but shallow works, while others see him as a forerunner of Russian Impressionism. Makovsky became a victim of a road accident (his horse-driven carriage was hit by an electric tram) and died in 1915 in Saint Petersburg.